A ceremony was held at the RAAF Memorial on ANZAC Parade with an address by Air Marshal Leo Davies AO CSC, Chief of the Air Force and Air Chief Marshal Sir Stephen Hillier KCB CBE DFC ADC MA, Chief of the Air Staff. Both praised the achievements of both air forces and underlined the importance of the close cooperation enjoyed by both nations in conflict and in peace time. Music for the event was provided by the Air Force Band and vocalists. The event was accompanied by a fly past by F/A-18 Hornet and PC-21 Pilatus aircraft, followed by a fly over of World War Two aircraft, a Spitfire and Hudson. The British High Commission generously provided travel and accommodation for three WWII RAF veterans, Tom Sutherland, Molly Sasson and Vic Leigh, as well as their escorts for the trip from Melbourne, Ted Hayes and David Watts. Following the service at the Catafalque lunch was served, then in the afternoon a Last Post Service was held at the Australian War Memorial’s Pool of Reflection. This was accompanied by a Spitfire aerobatic display over Lake Burley Griffin. That evening, a dinner was held under the wings of Lancaster G for Georgein the Australian War Memorial, where again entertainment was provided by the Air Force Band and the Stilettos Trio. Our RAF veterans were full of praise for the hospitality and organisation of a very appropriately arranged event. For my part, I was also very impressed by the young airwomen and airmen of both Air Forces who were very smartly turned out, very well informed and very courteous. Our Air Forces can be proud of their history and of their serving members; we are in good hands. 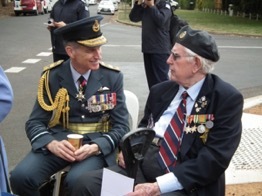 Below: Air Chief Marshal Sir Stephen Hillier, KCB CBE DFC ADC MA chats with WWII RAF veteran Tom Sutherland.